Actively engaging with your audience has to be one of your key presentation goals. And if you are using a PowerPoint deck of slides you should pay it even more attention than normal. That’s because you can rely on PowerPoint to do so much. But on its own, PowerPoint will not engage your audience. Because that’s your job to engage with your PowerPoint audience. Content. Ensure that your content is as relevant as possible for your audience. You can check its relevancy with some audience research or some insights into the industry or market which your audience represents. One easy route into relevance is topicality. Issues of the day will hold sway over more esoteric topics. Certainly, this Atlantis presentation did just that. Appear knowledgeable. A key PowerPoint presentation skill is rehearsal and practice. This is especially true if you are using the embedded media options in PowerPoint. You must be familiar with the material, its context and timing. Once you are familiar with your PowerPoint slides you will appear more natural. Don’t forget to build a sound structure to your presentation, know the facts and figures that you quote and don’t, whatever happens, be tempted to read from the slide screen. Not only do you turn your back on your audience but you also appear less knowledgeable. It’s a key way to engage with your PowerPoint audience. However, don’t forget that too many facts can have the opposite effect. Just take a look at this Barclays results presentation for this point. Eye contact. Establish it. Keep it. Use it. Eye contact is so important when you present. But PowerPoint tempts you into reading your notes or thinking that an audience is interested in reading a bullet list. They are not. They want to listen to you and become engaged with you. A key PowerPoint presentation skill is, therefore, to allow PowerPoint to do the media management. You stick to the job of speaking and maintaining the audience relationship. Take some questions. A well-built PowerPoint slide deck should allow you to hold a slot for questions before you reach your conclusion. Use a blank slide while you hold your question and answer session. You can also refer to supplementary slides if you feel they add something to an answer. The rules for all question and answer sessions still apply, however: keep them short and concise and you will achieve more engagement. Take a survey. Beyond the rhetorical questions, you can also ask a question of your PowerPoint audience. Aim to get an answer by a show of hands and then feedback the audience’s collective opinion to the audience. You can use PowerPoint slides to show the results of similar audience surveys with different audiences. It all adds up to a better level of audience engagement. Some very simple techniques will always help you to engage with your PowerPoint audience. Have good content in your presentation. Appear knowledgeable, so rehearse well! Maintain eye contact with your audience. Take some questions from your audience and then answer them. Take a survey with your audience’s participation. 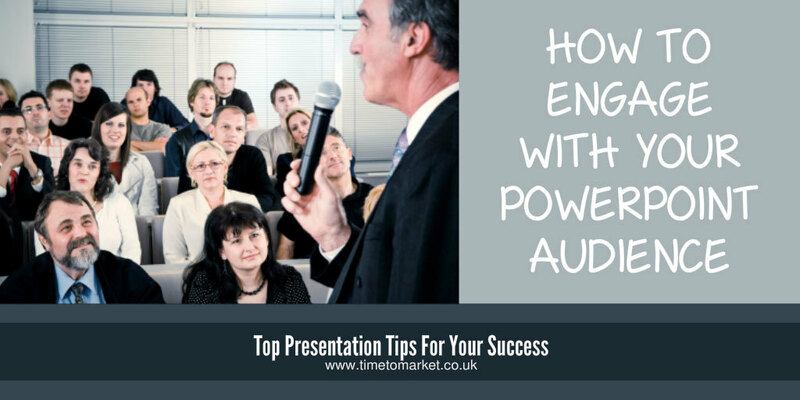 The skill of using PowerPoint software to engage with your PowerPoint audience goes beyond just using the superb media attributes of PowerPoint. Use the slide deck for what it’s worth but stick to the presenting basics to achieve a level of audience engagement that will really pay off. For more skills tips, you can always attend a public presentation training course held at one of more than 40 training centres. So when you are ready to engage with your PowerPoint audience, please don’t hesitate to call.